The Stiga STS 275 table tennis table is without question an ideal table for households and serious ping pong players. This table that provided by Stiga is a good looking, sturdy, and of premium quality. The company is always ensures in keeping their brand and reputation as top priority by consistently offering quality equipments to meet the needs of players of all level. You may find this table is really opponent-confounding and table-edge slam shot. It can provide you with durability, speed, even bounce, and quality spin for your shot. What’s So Cool About Stiga STS 275? There are many features that you can have with this Stiga STS 275 table tennis table. The table can provides you with a good quality 3/4″ table top that painted in blue color and meets the international tournament requirement. The surface is installed on a steel apron to offer players with rock-solid steadiness. By completing the installation, the table will stand on 2” square steel self-opening legs. It has a corner slap-shot to protect the table from warping. Players are protected by well-construct corner pads and they can simply pay attention to their shot without having corner-poked. The wheel casters are built with silver mag-ball which provides easy mobility of the table to playing location and for storage. When you purchase this table, you will have the 66″ net and posts shipped together. Stiga has focused themselves to the portability issue of this table with the feedbacks that they received from consumers. As a result, this table has been equipped with a set of four 5-inch silver mag ball-bearing wheels casters that provides good looking and as the same time offering remarkably functionality. With the availability of mag ball-bearing wheels casters, you will find it is effortless for you to move the table. The casters look great with modern design. They are stabilized by a molded beam panel. There is a heavy-duty chassis which make the table incredibly sturdy and durable where you can buy and play with it for many years. The table is designed with dedicating craftsmanship from the ground up, with the use of quality materials and skillful workmanship to create one of the top quality tables in the world. By the newly implementation of stylized corner pads, players will no longer need to worry for suffering from injury caused by sharp edges. Also there are no more injured legs and torn clothing happening after implementing of such cool element. 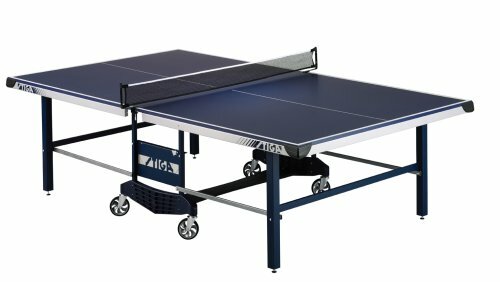 You will receive a 66′ net and posts that come together from your purchase of this Stiga STS 275 table tennis table.